Assistant costume design, suitable for anyone? Billy West imitates a radio DJ. Original plotline of the episode involving Fry's mother. 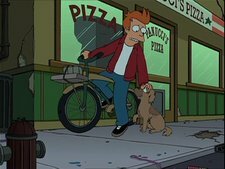 The scene with Seymour in the sauce was cut at the animatic stage and re-inserted at the request of the animators. Naming the video game at Panucci's. Pointing out cuts in pilot episode. Leela's workout outfit is based on a Leela toy. Bender's emotionalness is very useful. Dolomite is an actual mineral. This page was last edited on 27 August 2013, at 19:42.